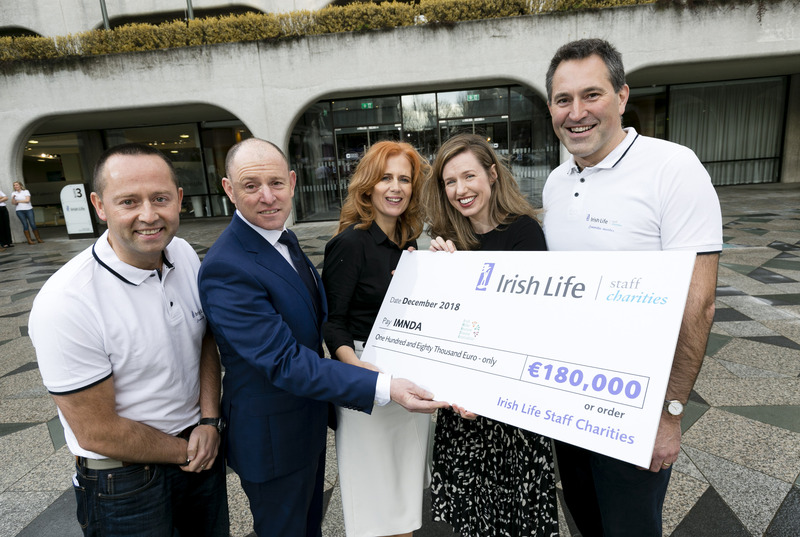 12th December 2018 – Irish Life has announced that its employees have raised a fantastic sum of €360,000 for two Irish charities, the largest amount ever donated in a single year by the company. The funds have been raised throughout 2018 by its 2,400 employees through various fundraising initiatives, and the amount was then matched by Irish Life to reach this final total. This year, the charities chosen by Irish Life staff are the Irish Motor Neurone Disease Association (IMNDA), the principal organisation dedicated to working with people living with MND and their families and carers, and Remember Us, which provides a unique social outlet to people with special needs and their families. Each charity this year will receive a fantastic donation of €180,000 from Irish Life to help provide essential support services, ongoing equipment needs, and critical research funding. This is the largest amount ever raised by Irish Life in one year and equates to almost €1,000 raised every day by staff this year. Commenting on the donation by Irish Life, David Harney, Chief Executive, said; “We are delighted to donate this significant amount to two very worthy charities this year. The spirit of serving communities in which we’re based and supporting those in need is a key part of our culture here in Irish Life, and this donation to IMNDA and Remember Us reflects that. I’m very proud of our staff for really getting behind this initiative each year and being so supportive of our fundraising initiatives and giving their time for such worthy causes”. Irish Life employees took part in many fundraising activities this year for the chosen charities. These activities included; 185 staff took part in Hell and Back in June, 125 staff completed the Great Dublin Bike Ride, 200 staff participated in the ‘Last Man Standing’ weekly soccer prediction competition, table quizzes, a ‘Ticket Fairy’ competition for monthly salary contributors, and additional funds were raised by staff who ran marathons and competed in triathlons throughout the year. Each year, the Irish Life Staff Charities committee shortlists a number of Irish charities to receive donations collected throughout the year, and the final two are selected by Irish Life employees. Since its inception, the Irish Life Staff Charities initiative has raised in excess of €2.9 million for a wide range of Irish and international charities.